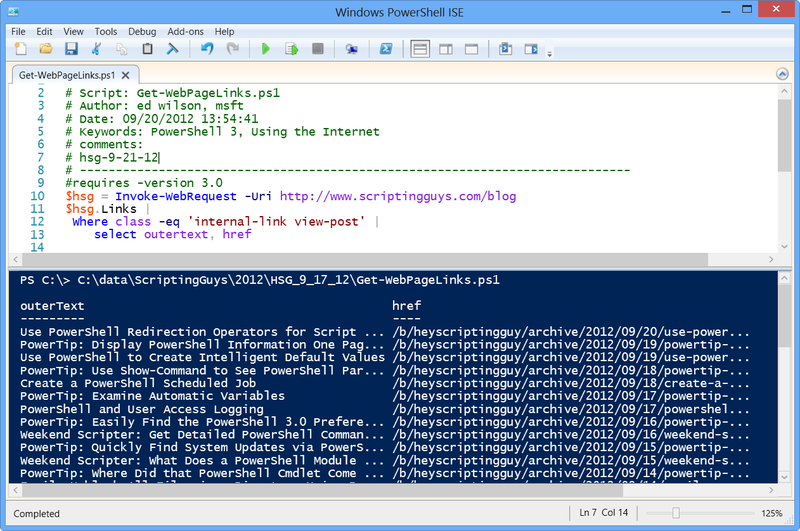 Summary: Microsoft Scripting Guy, Ed Wilson, shows how to use Windows PowerShell 3.0 to easily download web page links from a blog. The Scripting Wife continues to hammer away at the details for our three-week European tour, and the emails, Facebook posts, and tweets are flying back-and-forth across the big pond nearly 24-hours a day. When we have everything organized, I will post updates on the Scripting Guys Community page. By using the Invoke-WebRequest cmdlet in Windows PowerShell 3.0, downloading page links from a website is trivial. When I write a Windows PowerShell script using Windows PowerShell 3.0 features, I add a #Requires statement. (I did the same thing in the early days of Windows PowerShell 2.0 also. When Windows PowerShell 3.0 is ubiquitous, I will probably quit doing this.) Here is the #Requires statement. The next thing I do is use the Invoke-WebRequest cmdlet to return the Hey, Scripting Guy! Blog. I store the returned object to a variable named $hsg as shown here. The object that is stored in the $hsg variable is an HTMLWebResponseObject object with a number of properties. These properties are shown here. I decide that I need to use the Links property to return the hyperlinks from the Hey, Scripting Guys! Blog. This command is shown here. As I looked over the returned links, I noticed that their appeared to be several different classes of links. To review the different types of links, I piped the classes to the Sort-Object cmdlet, and I used the Unique switch. This command is shown here, along with the associated output. From this output, I see that I am interested in only the outerText, and the href properties. I select these two properties, and am left with the script that is shown here. The script and associated output are shown in the image that follows. One thing that might be interesting is to send the output to the Out-Gridview cmdlet. This would permit easier analysis of the data. To do that would require only adding the Out-GridView command to the end of the script. The modification is shown here. Join me tomorrow when I will talk about more cool Windows PowerShell 3.0 stuff.